102 Pike St., Seattle, Washington 98101. This corner store is at the gateway to Seattle’s historic Pike Place Market – a location of rich history and vital importance to both Starbucks and the Emerald City. It was, after all, in the Market that the original Starbucks opened in 1971. 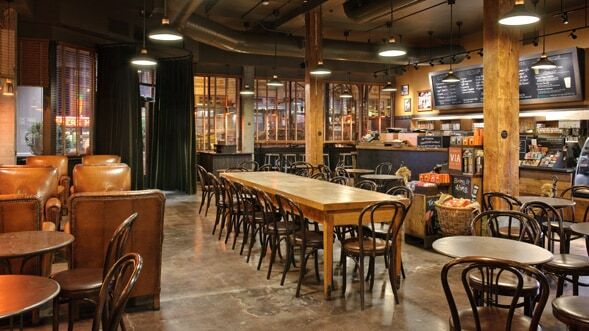 The design of our 1st & Pike coffeehouse evokes the warm heritage of that first store through its hardwoods, furniture and lighting. The store is LEED® Gold certified. During construction, we made sure to recycle as much of the construction waste as possible. The leather on bar’s outer facing was scrap obtained from shoe and automobile factories. The walnut used in the tables, doors and bar top was salvaged from a nearby farm. The signage on the bar uses recycled slate from a local high school. The community table is twice reused; it was previously located at a Seattle restaurant and before that, in a home. The restroom partitions are made from recycled laundry detergent bottles. The wall tapestry is made of repurposed burlap coffee bags from our local roasting plant.